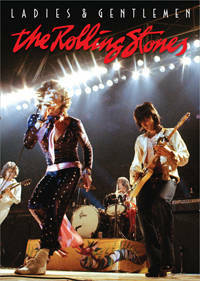 The first official digital release of the notoriously bootlegged 1977 concert film Ladies and Gentlemen…The Rolling Stones (I’ve owned an underground copy on tape for nearly 20 years) blows away my scratchy VHS copy. 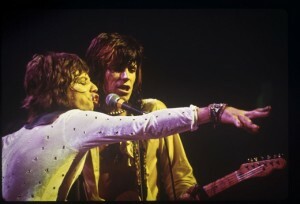 Assembled from four arena shows filmed in Fort Worth and Houston during the band’s 1972 tour to support their soon to be classic Exile on Main St. album, Ladies and Gentlemen finds The Stones — who were often criticized for their “lackadaisical shows” at that time (Mick Jagger’s words) — giving their liveliest performances of the era (which Mick also agrees with). Nobody can complain about the 15-song setlist, which spotlights some of Exile’s greatest numbers (“Happy,” “Sweet Virginia,” “Rip This Joint”), a few certifiable classics (“You Can’t Always Get What You Want” “Jumping Jack Flash,” “Gimme Shelter”), and a deep cut or two (“Dead Flowers,” a cover of Chuck Berry’s “Bye Bye Johnny”). The 1972 tour was the last “intimate” tour The Stones would take before their shows morphed into the super-sized, theatrical arena-and-stadium spectacles they’ve been doing for the past quarter-of-a-century (not counting filmmaker Martin Scorsese’s Shine a Light). And for fans, the chance to observe the band and their interplay on a relatively small stage is the sweetest of treats. The supplements on the DVD are equally tasty. There’s some brief rehearsal footage of the band working out on three songs, along with two interviews with Mick, one from the 1972 British TV show The Old Grey Whistle Test and, better, one that was taped in early 2010. Ever the frontman and imparter of the band’s lore and legacy, Mick appears to be very happy with what he sees — and with what he sang all those years ago.